On May 23, 1934, citizens across America tuned into news broadcasts coming from Bienville Parish, Louisiana that outlaws Clyde Barrow (1909-1934) and Bonnie Parker (1910-1934) had been shot and killed by law enforcement officials after a carefully laid trap to snare the wanted fugitives. Their deaths bring an end to crime spree that left several police officers dead and put the couple on the list of America’s most wanted. At the time of their deaths, both were under the age of twenty-five and their story has been both romanticized and distorted in films and books. The film taken of their car following the shooting can easily be found online. It is a chilling piece of a postmortem recording with Bonnie’s body sitting limp inside the front passenger side seat still clutching the partially eaten sandwich she had ordered for breakfast that morning. In death, they would become part of American lore from an era in which banks were robbed, V-8 engines ruled the road and the middle of the country was home to nearly every outlaw known to authorities. But who were the real Bonnie and Clyde? And how much of their story is truth and how much is fiction? Author Jeff Guinn has investigated these questions and others as he presents to us the untold truth of the story of the couple. The story beings and takes place mostly in Texas with West Dallas serving as home base for both of them. But their life of crime spread out across several states, earning them the wrath of law men determined to see their demise. Without questions, their exploits are what attracts people to them. Like Charles Arthur “Pretty Boy” Floyd (1904-1934) and George “Baby Face” Nelson (1908-1934), Bonnie and Clyde are poster figures produced in a time in which the depression was in full swing, cars were easy to still, guns plenty and an organization known as the FBI was developing under the direction of J. Edgar Hoover (1895-1972). The past seems distant but it was less than one hundred years ago when these notorious figures traversed America on paths of destruction before meeting violent ends. But to understand these figures, it is necessary to understand their lives and this is where Guinn excels in revealing the truth to the story of Parker and Barrow. The tendency we have when examining a person’s life is to seek a moment that explains their evolution to a new level of greatness or infamy. But with Parker and Barrow, it was not so much a moment but a series of events in each of their lives that led to the development of the most dangerous couple in American history. And what Guinn tells us might surprise readers expecting to find tragic childhoods for both. In fact, although poverty was an issue in rural Texas, both the Parkers and Barrows found ways to make ends meet and maintained strong bonds with the couple until the time of their deaths. Barrow’s mother Cumie, is perhaps the most pitiable for throughout her life she never stops loving her son. Bonnie’s mother Emma, is cut of the same cloth, never-ceasing to love her daughter even as she sinks deeper into a life of crime. And through Guinn’s words, they appear not just as violent outlaws, but as a couple deeply in love, dependent on each other and unable to keep their families’ hearts from breaking. Theirs’ is a tale of tragedy and violence that could not possibly end with redemption and a second chance. In addition to presenting their story, Guinn clears up many erroneously reported facts, setting the record straight once and for all. In an era before television, the internet and social media, word of mouth spread quick and with each crime, Parker and Barrow grew into larger than life characters that put fear in the hearts of anyone they crossed. Clyde is rightfully credited as the leader of the Barrow Gang and the reason for Bonnie’s descent into a life of crime. But to understand the dark mind of Clyde Barrow, a visit to his past, in particular his time at Eastham prison, is necessary for his transformation from small time crook to feared outlaw begins there. That section of the book, like the shootouts with authorities, may not be an easy read for some. The descriptions are graphic leaving no stone unearthed so that the reader can fully understand the presence of death that was formed and remained with the Barrow Gang. The full nature of their murder spree and their willingness to gun down law enforcement officials was a times shocking and at other times jaw-dropping. In fact, as I read the book, I felt as if I were transplanted back in time looking over the shoulders of the gang as they slept in cars, traveled back roads a high-speed and allowed their minds to become filled with delusions of grandeur about a life together in tranquility after their life of mayhem was over. The book is well-researched and well-written. 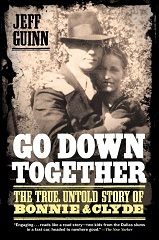 Much has been written and said about the duo over the past seventy years but Guinn’s book stands as a complete and unbiased account from start to finish of the lives and deaths of Bonnie and Clyde. From the day I started it, I could not put it down as I was pulled into a masterpiece about two of America’s most dangerous and idolized historical figures.